Yes. I am well aware that today is in fact Monday. As someone who suffers from the occasional “Sunday Scaries,” I have started to fully embrace showing myself a little self-love before the weekend ends and the new week begins. I feel like my weeks goes something like this: Monday-Tuesday-Wednesday-Thursday-Friday—blink—and it is Monday…again. Yours, too? So, to combat the feeling that I work 24/7 and never have any time for myself, I have made a conscious effort to make Sunday all about self-care (of course, when Sunday is occupied, a Saturday will work, too). My day of self-care typically begins with a morning walk to get a coffee. This weekend, I decided to stop at Real Food, Real People, and bring along a book. 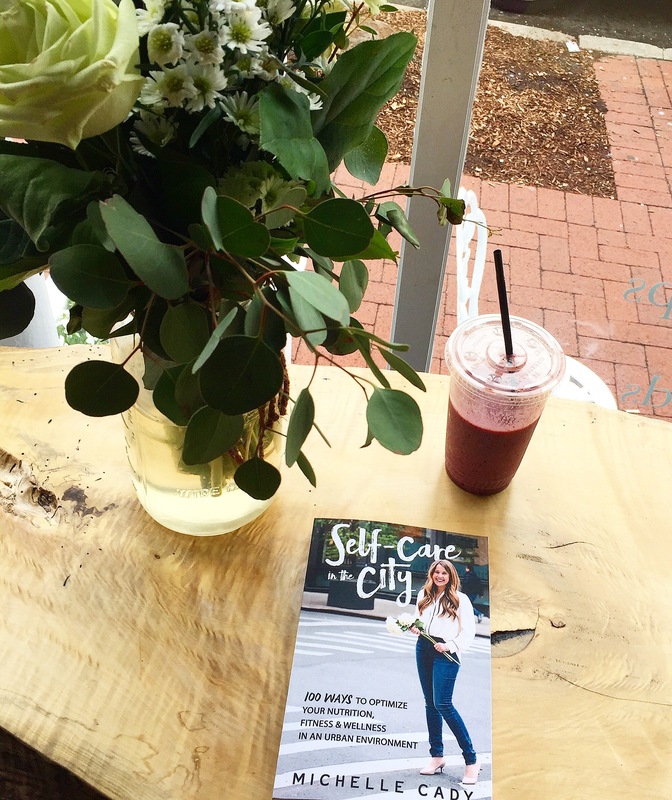 As I sipped on my berry protein smoothie, I started reading Michelle Cady’s new book, Self-Care in the City (pick up your copy, here). Michelle is a New York City-based health coach that I connected with through Instagram. After chatting with her by phone last week, I knew I needed to order her book. But for now, I spent my Sunday morning enjoying a book, in the nook of a beautiful space. It was the perfect way to start my leisurely #Sundaze. After getting a few pages in, and a smoothie in my belly, I walked to pick up groceries to meal prep with for the week. I haven’t walked to get groceries since I lived in Washington, D.C. as a college student sans car. It certainly brought back memories, and also reminded me that I could only purchase what I could carry (so much for overbuying!). Once home, I unpacked my groceries and got busy thinking of things to make for the week ahead. I’ve never been much of a meal planner, but I suddenly found lots of joy (not to mention, a real sense of accomplishment) when I successfully planned my meals for the first few days of the week ahead. Next up, of course, was cleaning and laundry. But after that, it was all about an at-home facial and a manicure (Essie’s California Coral, in case you were wondering). Before I knew it, it was 10 p.m.—time to put my feet up and celebrate a day of self-care well done! How do you show yourself self-care on the weekend? That’s sounds like the perfect Sunday! I think we need to do a self-care weekend at the spa sometime in the near future. Lol! Absolutely, Kathrine! Just let me know when and I’m there! It is so important to just relax and take care of ourselves sometimes. This sounds like the perfect Sunday especially the at-home facial! Thanks, Freja! Self-care is so important and we really need to make time for ourselves.